Available through the newest Humble Bundle, PC and Android gamers can grab $100+ worth of titles for whatever price they want, with extra goodies added in for paying a minimum of just $4.30. 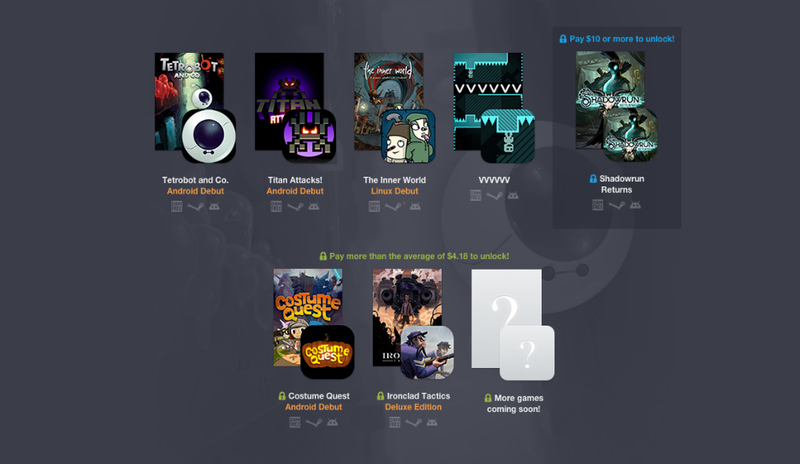 Included in this bundle are the titles Tetrobot and Co, Titan Attacks!, Inner World, VVVVVV. Buyers can pay whatever they want for these first four titles, gaining access to PC downloads, as well as Android apps. Additionally, if you pay a minimum of $4.30, you also get Costume Quest and Ironclad Tactics. For those who pay $10 or more, you get Shadowrun Returns in addition to everything else. As always, more games will be added soon, so be sure to keep your eyes peeled for new titles if you decide to pay over the minimum.